Making a wholesome, no added sugar treat for yourself and your family couldn’t be easier! Too many food items you find in the store are full of ingredients that belong in a toxic waste depository rather than in a food item that’s consumed by kids or grownups. 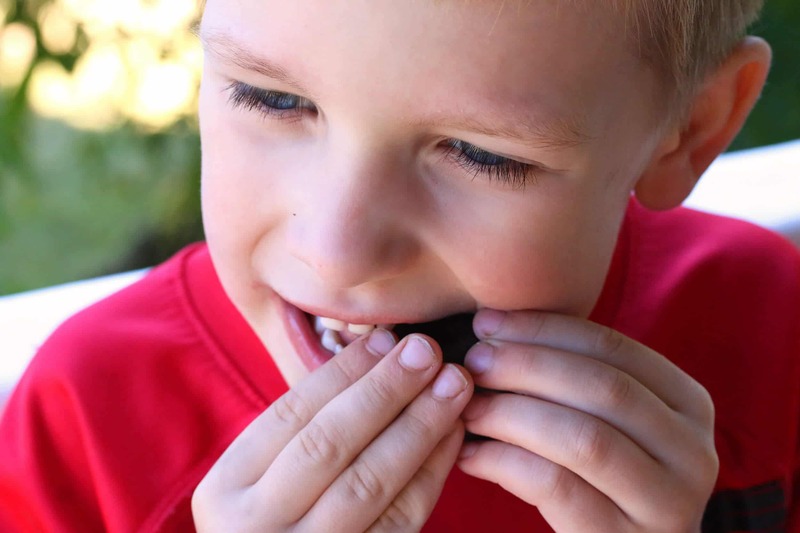 Fruit leather is an age-old natural sweet treat that needs absolutely nothing else added to it to be delicious, perfectly chewy and visually attractive. Yet too often the store-bought stuff adds fillers, preservatives, ingredients to improve texture and food coloring. And usually the fruit is from concentrate. Now compare that with the ingredients list of homemade fruit roll-ups: 100% real whole fruit. 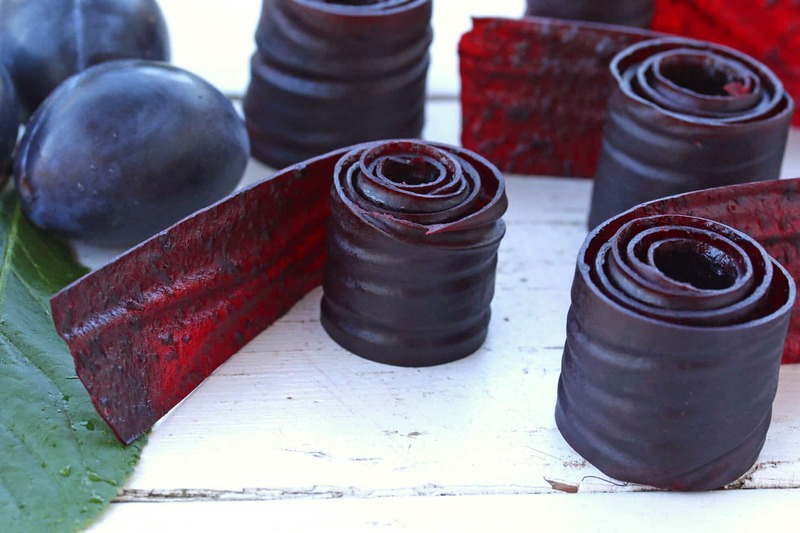 Throw that store-bought stuff in the garbage where it belongs and discover how crazy simple it is to make fruit roll-ups yourself! 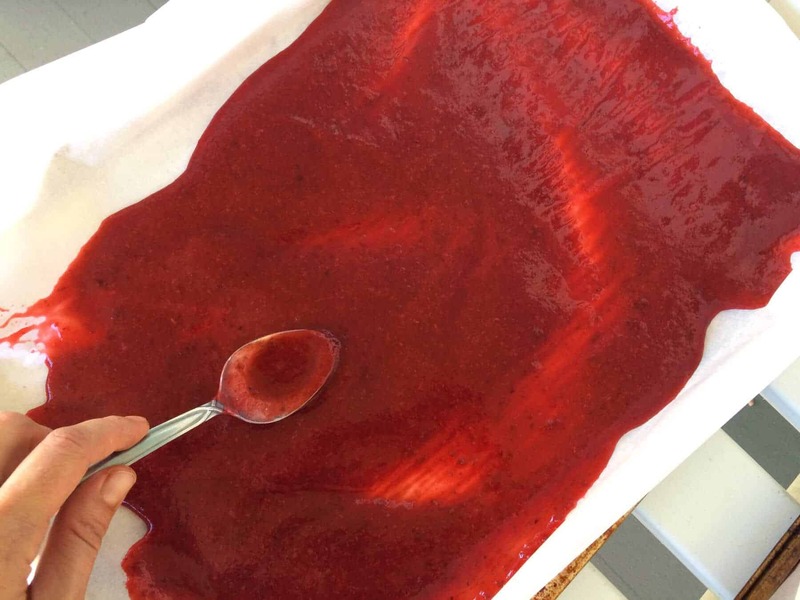 This method of making fruit leather can be used for most kinds of fruit, and how much water you add to the fruit will depend on how juicy the fruit already is. Choose the fruit you like best or use a combination of fruits or berries. There are so many fun and flavorful combinations like apple-pear, strawberry peach, banana strawberry, and the list goes on and on. You can also add spices like cinnamon and cloves to your fruit leather. We have three Italian plum trees on our property and I’ve been putting them to use in a variety of ways (plum butter, plum sauce, canned plums, dried prunes, etc), all in an attempt to not let any of the fruit go to waste. 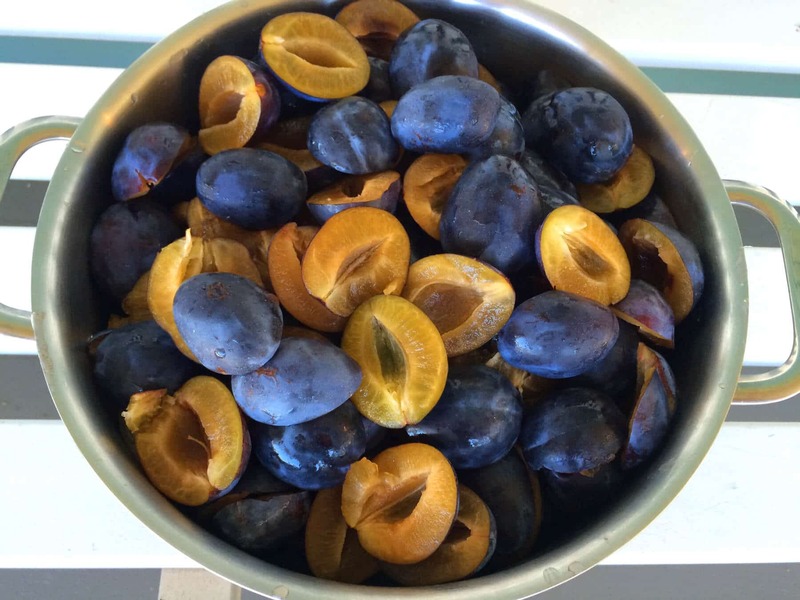 I’ve successfully processed over 250 pounds of plums in the past four weeks! 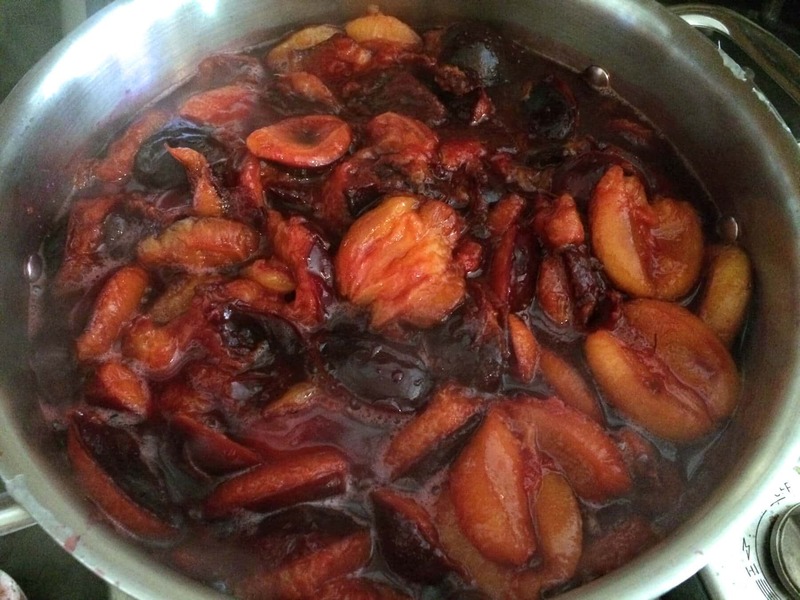 Making plum leather is one of the ways I’ve been putting these plums to use. We also have apple and pear trees and have been making and bottling a bunch of cider. I’ll also be making apple-cinnamon leather for our family as well – my kids have already been begging for it! My kids LOVE this stuff. They’ll do practically anything for it. 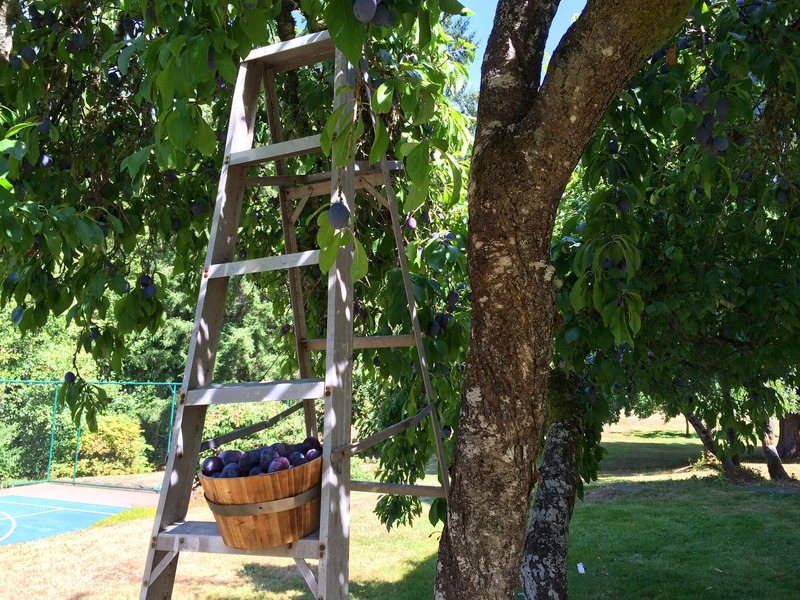 (Hmmm, now that’s an idea :) They’ve also been enjoying helping me pick and wash and de-seed the fruit. But most of all, they enjoy devouring it. And it’s a great feeling to give your kids something that you know is pure and wholesome. Once you’ve made your first batch of it you’re going to make it again and again, because it’s so, so simple to make! 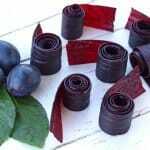 Again, I’m using plums to illustrate how to make fruit leather, but you can use any fruit of your choice. Place the fruit in a pot. 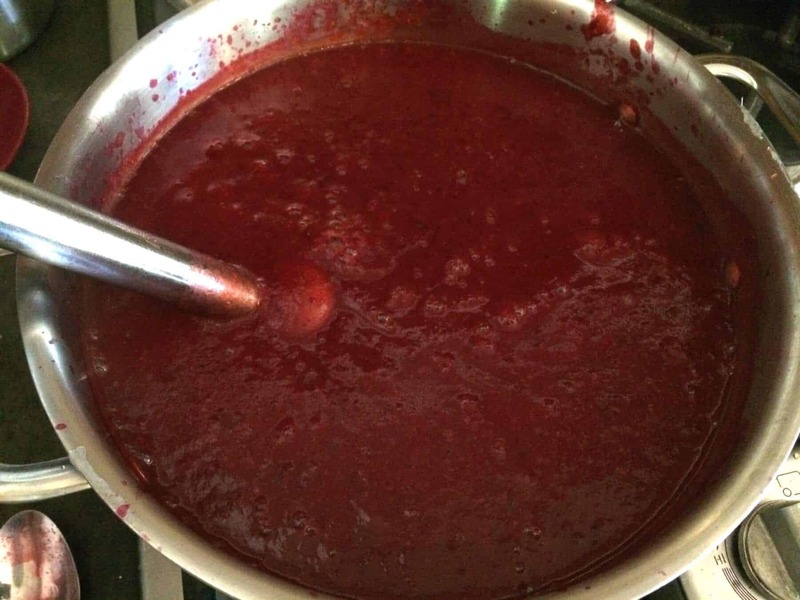 If the fruit is really juicy, like plums, apples, peaches, etc, then you hardly have to add much of any water, just barely enough to keep the bottom from scorching. So just eyeball it, add maybe 1/4 cup or water or so. Check on your fruit as it is stewing to make sure it isn’t scorching. If it looks like it needs a little more water, add more. Cover and stew the fruit for 5-10 minutes or until softened. Puree the fruit until smooth. You can transfer it to a countertop blender or use an immersion blender. Pour the pureed fruit onto lined cookies sheets (either silicone or parchment paper). Spread it out to a thickness of about 1/4 inch or slightly less. You can dehydrate the fruit leather in either a conventional oven or in a food dehydrator, whichever you prefer. I have a dehydrator but prefer to use the oven for this. It’s super simple spreading it out on two cookies sheets and placing them in the oven. Heat the oven 140°F. To speed up the process you can turn on the convection setting if you have one. Typically it takes 8-12 hours to dry out. You’ll know your fruit leather is done when the surface is smooth and no longer sticky. If you’re using parchment paper the fruit leather is easiest to remove while it’s still slightly warm to prevent it from sticking to paper. I prefer to use a silicone baking mat but my new mats were still on their way for delivery when I made this. Still, either works well. Slice the fruit leather into strips. 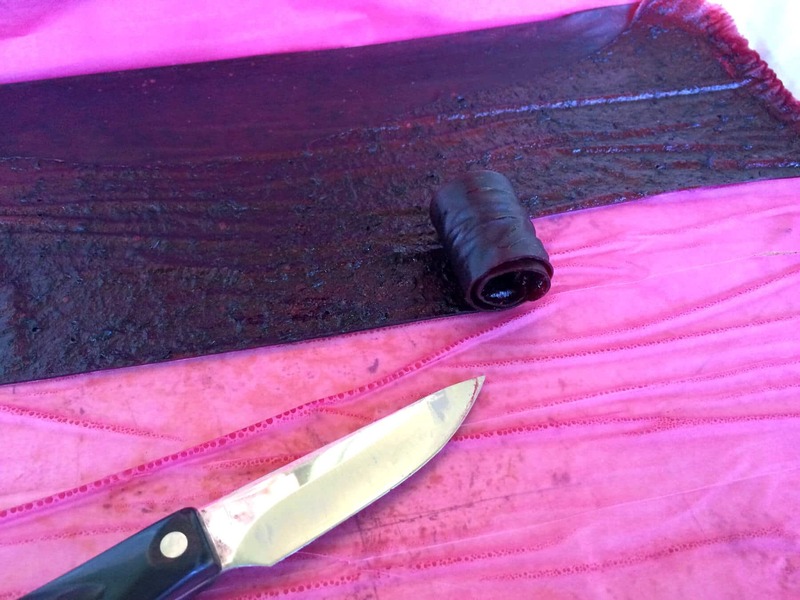 You can store the fruit leather either as one large strip and slice it later or store it in strips. To store it, roll it in plastic wrap and then in an airtight container in the fridge or freezer. Naturally gluten free, paleo and vegan. 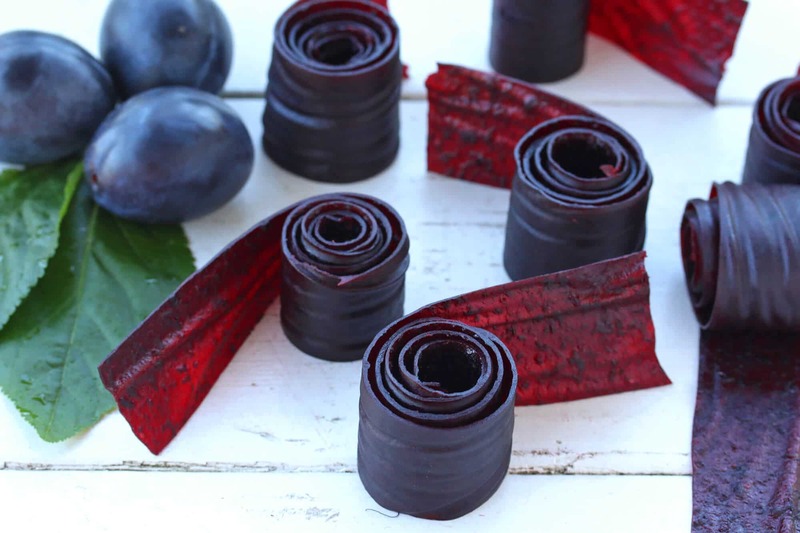 Making your own fruit leather is not only simple, it's free of junk ingredients and tastes even better than store-bought! Place the fruit in a pot (if using ground spices, add them too). 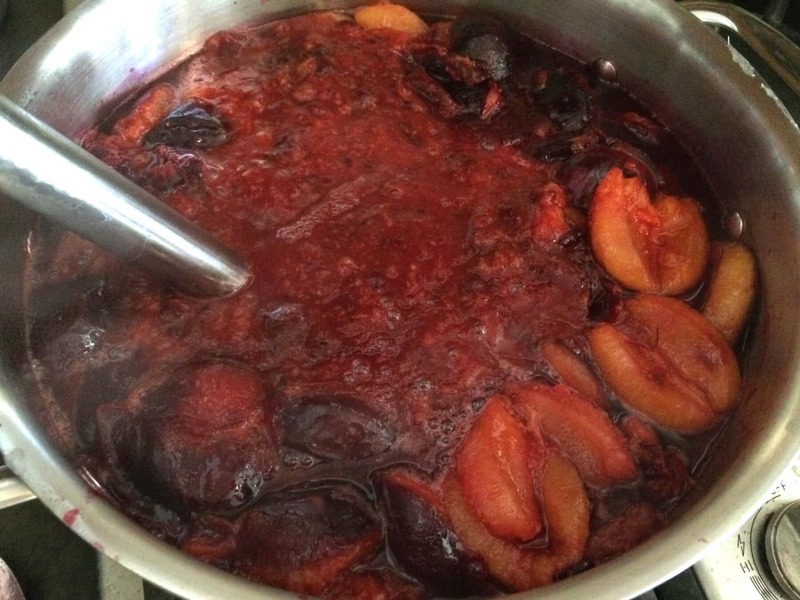 If the fruit is really juicy, like plums, apples, peaches, etc, then you hardly have to add any water, just barely enough to keep the bottom from scorching. So just eyeball it, add maybe 1/4 cup of water or so. Check on your fruit as it is stewing to make sure it isn't scorching. If it looks like it needs a little more water, add more. Cover and stew the fruit for 5-10 minutes or until softened. Puree the fruit until smooth. You can transfer it to a countertop blender or use an immersion blender. Pour the pureed fruit onto lined cookies sheets (either silicone or parchment paper). Spread it out to a thickness of about 1/4 inch or slightly less. Heat the oven 140°F. To speed up the process you can turn on the convection setting if you have one. It typically takes 8-12 hours to dry out. 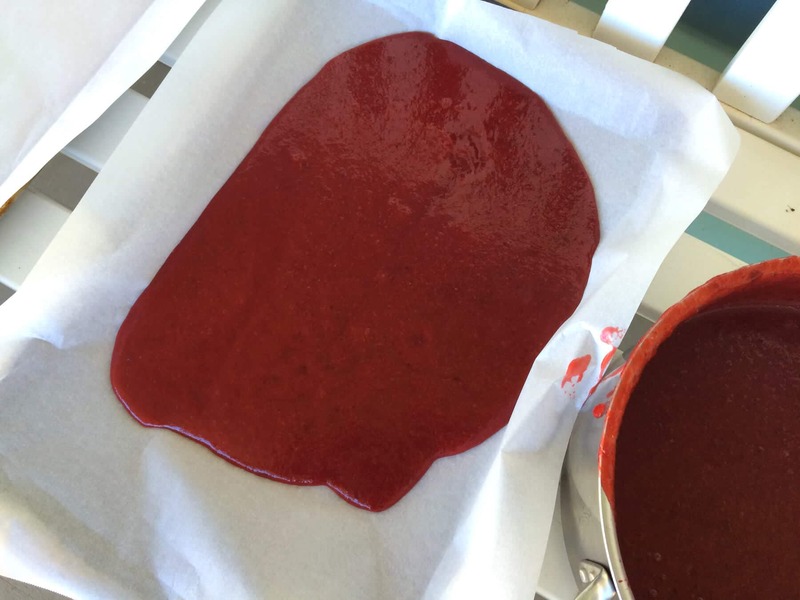 You'll know your fruit leather is done when the surface is smooth and no longer sticky. (Note: You can dehydrate the fruit leather in either a conventional oven or in a food dehydrator, whichever you prefer. I have a dehydrator but prefer to use the oven for this. It's super simple spreading it out on two cookies sheets and placing them in the oven. I was just having a conversation with a friend of mine about what’s on labels. She happens to make every snack her boys eat and fruit leather is one of them. I just picked up a bag of gorgeous plums and will make this first!! This is just the coolest!! My kids are going to love it! 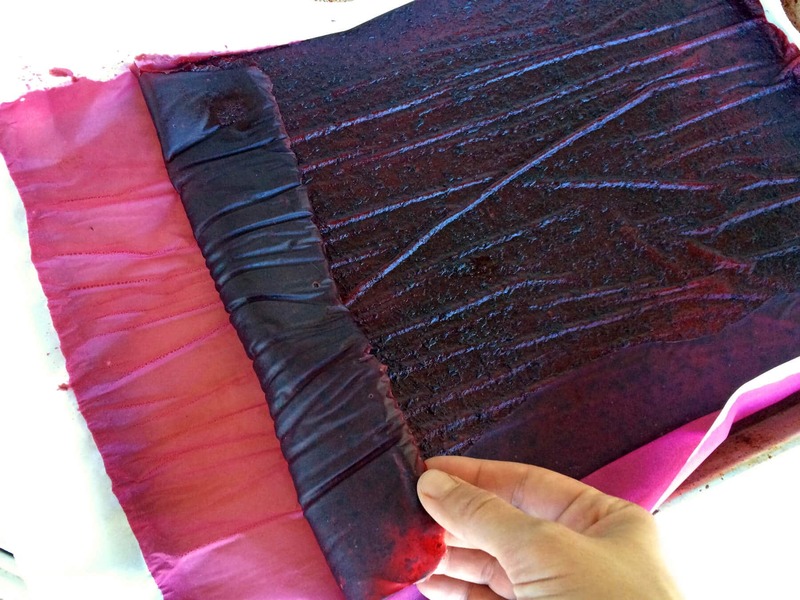 I never realized how simple it was to make fruit leather at home! Never buying store bought again! Homemade fruit leather holds a special place in my heart because my mom always made it for us when we were kids. BUT, I’ve never tried a plum version and I totally need to change that. The color is stellar and I can almost taste it! Oh wow… I’m totally making this for my kiddos! Wow, those instructions are so easy to follow. This looks like a treat my kids will love too. This looks so much easier than I thought. Have you ever mixed any fruits together?? This recipe has come at just the right time. I don’t have any plums, but our pear trees are loaded this year and did not feel like canning them. I was going to just dry slices, but now I will make pear leather! Maybe a few strawberries mixed in a batch. Thank you for this great idea. Fantastic! What an easy treat! Although my kids are grown, I will try these out for my hiking trips with my husband.Easy to pack up in our backpack. Thanks, Kimberly. 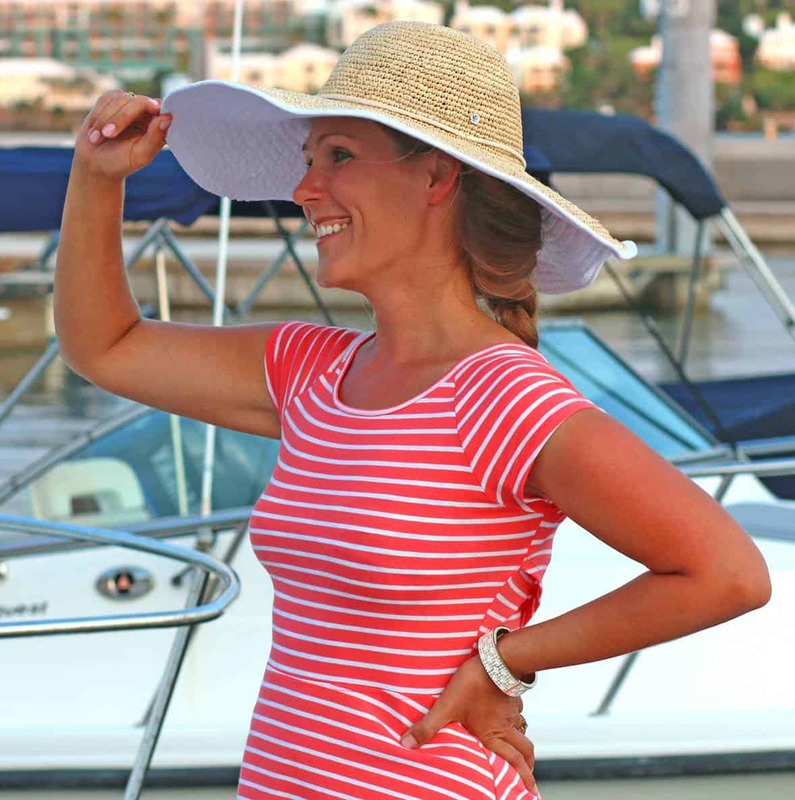 Your photos (as always) are gorgeous! So are your kidlets. What a fun recipe. 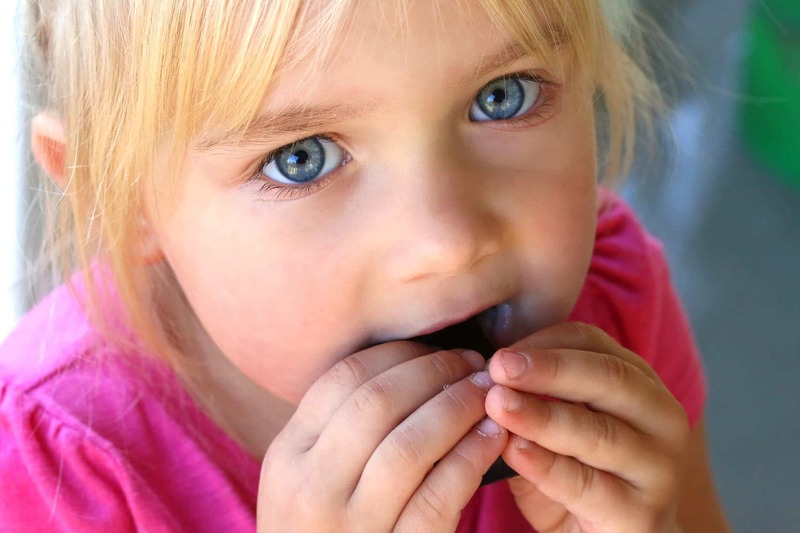 Your fruit leather is the perfect lunchbox snack for little hands. 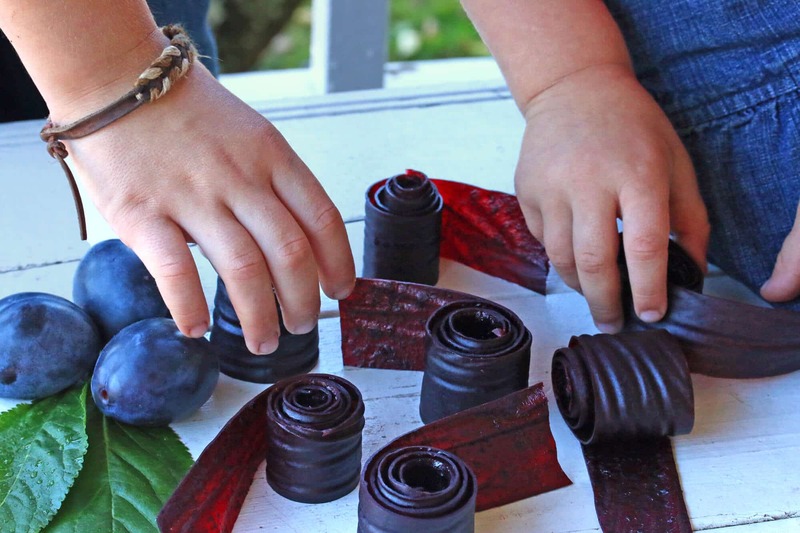 I had no idea that it was so easy to make fruit roll ups at home. My mom use to pack them for us in our lunches all the time. Can’t wait to make some! This is awesome! And I love your plums, they look so good. Also, as a photographer myself, I enjoy your food photography alot! I’ve never made fruit leather but you have inspired me!! I LOVE this! I am going to have to try this! I just have to decide which fruit I want first! 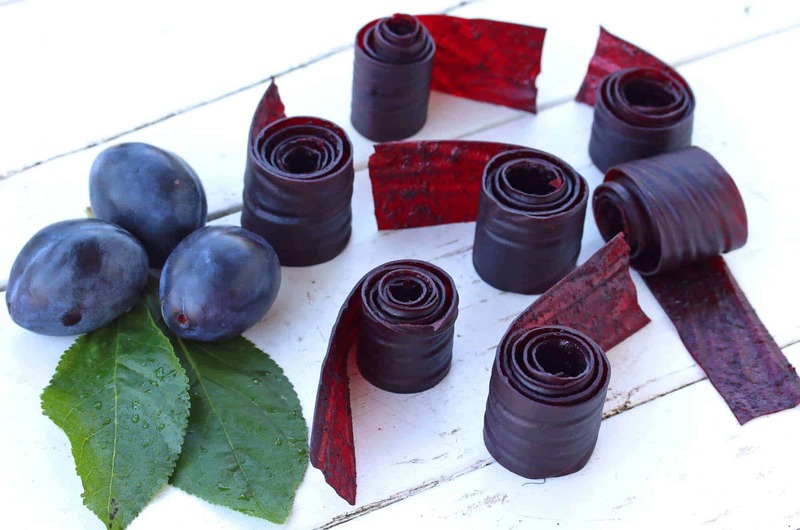 Nothing beats homemade fruit leather. Love the idea of plum leather. That’s one I’ve never tried. It looks wonderful. Just wondering why you prefer the oven. I have a dehydrator and can make so much more using it. Is there a drawback? Hi Johnnie, no drawback at all to using a dehydrator. I can just fit more in my oven using large cookie sheets and cleanup is a breeze. Deeeelicious! Absolutely NO reason to buy these, there’s so easy to make, taste 100% better and are so much healthier. Thank you for sharing this recipe, we’ve used it several times already! I really want to try this recipe, but I don’t have a dehydrator and when I turn on the oven, the lowest temp it’ll go to is 170. Is that safe to make the fruit leather? Or will that burn it? Hi Sujata, that will be perfectly fine, I would just leave the door of the oven cracked open slightly. Hello. 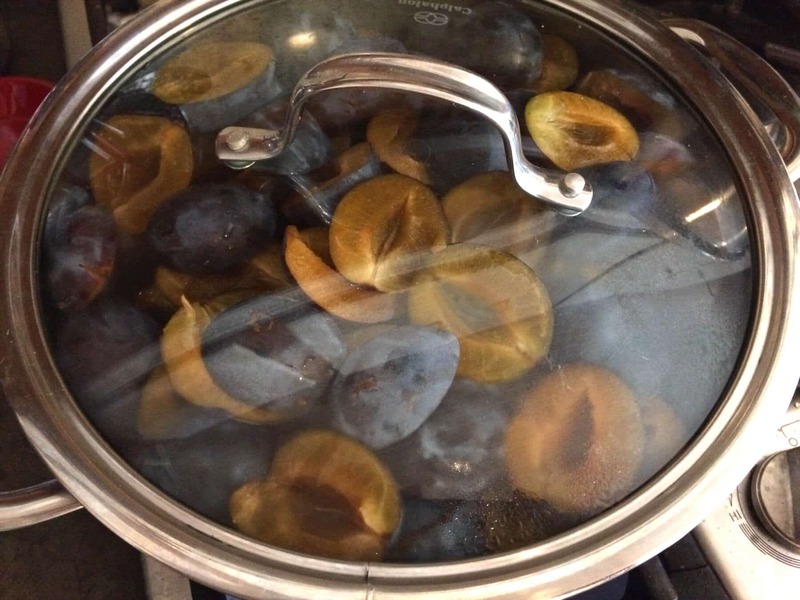 Would this recipe work if using figs? Hy cohly, you can use this process for any kind of fruit, just know that with figs the texture of the leather will be very gritty from all the tiny seeds. can i just put the fruit thru a juicer and then dry it or do you need to cook first? Hi Chris, if you put the fruit through a juicer it will remove all the pulp and you’ll end up with fruit juice, not fruit pulp. You need fruit pulp in order to make leather. Hello, is it inside oven at 140 for 8-12 hours? I really want to make this but not sure about having my oven running for that length of time. Yes, that is correct. The alternative is to use a food dehydrator. If I end up with fruit chips did I have the oven on too high? Hi Subhadra, yes, it was either on too high or the leather dried too long. I have apple-strawberry-carrot leather in the oven and cannot wait to try it! 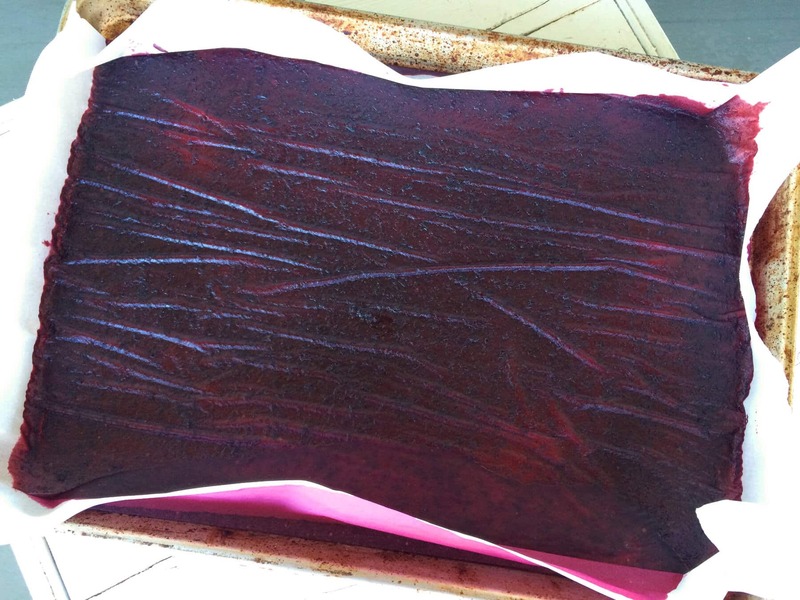 I have made fruit leather few times including with veggies but cannot get a consistent texture. What do you recommend for the portions of fruit like two cups or three. I didn’t see it on the recipe. Thanks! Hi Jasmine, I haven’t tried making fruit leather with veggies so I’m unable to make recommendations for the ratios. Perhaps one of our readers has and can chime in. Trying this with half blueberries, half SCOBY (mixing the SCOBY in after I cook the fruit, I don’t wanna kill it)! I tend to grow lots and lots of extra SCOBYs when I make my kombucha, if this works it’d be a great way to use ‘em up (and sneak some probiotics into the kid’s treats!